Children: Children come for enrollment from 6 – 8 p.m. If you are interested in joining the WICI Song and Dance Company adult troupe as a dancer, please be aware that this is a volunteer position that requires a tremendous commitment. We welcome new members throughout the year at any of our weekly dance rehearsals. Rehearsals are held twice a week, on Monday and Friday evenings, from 7-10 p.m. 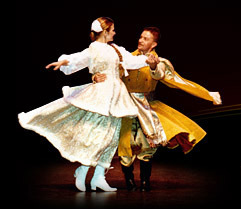 In addition, dancers are expected to perform at approximately 40 concerts throughout the year. In an uncontrollable situation we can excuse the dancer from certain performance. WICI membership is not equivalent to attendance in a dance academy or school. No registration fees are charged to join, and there is no defined term of participation. At WICI, our objectives are to transmit and uphold the highest standards of Polish folk tradition through song and dance. This is accomplished through a meticulous focus on developing artists who display above-average skill, dedication, cooperation and “stage presence”. While some of these characteristics can be taught through attendance at WICI rehearsals, certain individuals will naturally excel, and will therefore advance to the most prominent positions of the troupe (solo positions, etc.). Each WICI member must present proof of insurance coverage through the Polish National Alliance. Those with a valid insurance policy may present their policy number upon joining; nonmembers may join the PNA on site as well. For more information, please contact Artistic Director Magdalena Solarz at: 773/777-8800.